Earlier this year, I reviewed the R. L. Allan's edition of the Oxford Brevier Blackface KJV, concluding that the cover is magnificent and the blackface interior is one of those love-it-or-hate-it propositions, a little too dark for my taste. So it was only natural that I'd take an interest in the less emphatic Brevier Clarendon. 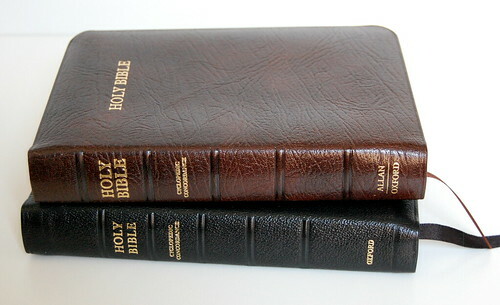 Reviewing the list of editions at Bibles-Direct.com, I noticed that the Brevier Clarendon was available in a "brown, buffalo grain calfskin, leather lined in tan." Given my predilection for brown these days, I figured that was perfect. Above: The Brevier Clarendon in Brown Calfskin (Allan 6C) on top, compared to the Brevier Blackface in Black Highland Goatskin (Allan 20). According to the measurements given on the site, the Blackface is slightly thinner and taller than the Clarendon, but when I stack them next to each other, the proportions look pretty much identical. Inside, the Clarendon offers a couple of advantages. In addition to the type not being quite so black (though it's by no means light), the self-pronouncing feature -- which in the Blackface goes so far as to break the name "Jesus" into two accented syllables every time it appears -- is absent, and brief chapter summaries are added. The cyclopedic concordance, which does double duty (as the name suggests) as both concordance and succinct encyclopedia, is present in both. The pagination is the same, so I assume they're identical.